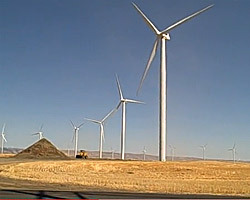 The Bonneville Power Administration is pursuing innovative new ways of incorporating rising amounts of wind energy into the Northwest power grid, as a recent story in The Oregonian explained well ("No more give in the Northwest power grid," July 18). But we're doing so in a way that also protects ratepayers from inappropriate costs and makes sure our electricity remains reliable. The power system requires that generation of electricity perfectly matches the amount consumed at all times. But we don't always know when the wind will blow. Wind power can ramp up and down sharply with little notice. So we must have other power generators on reserve to balance changes in the wind so there is neither too much nor too little electricity at any moment, which can lead to blackouts. BPA primarily relies on the federal hydro system on the Columbia and Snake Rivers to provide these reserves. BPA has taken two important steps to protect the reliability of the power system as wind energy continues to grow. First, we put in place systems last year to temporarily control the output of wind farms when wind ramps exhaust the reserves we keep on hand to balance wind energy. This protects the reliability of your electric service. Second, we put in place a rate that includes price signals encouraging wind operators to focus on better predicting and managing the ramps. That eases demand on the hydro system that remains a backbone of the Northwest energy supply and is itself renewable. The article suggested we backed away from this rate after proposing it. Actually, what we did was give wind producers a clear business choice. We were willing to provide a high level of reserves -- enough that would mean only rare limits on wind. But that would require a higher rate. Alternatively, we could provide less reserves at a lower rate, with occasional limits on wind energy generation when necessary to keep the grid in balance. We gave customers a choice as to the level of service they wanted tied to the rate they would pay. They chose lower reserves and lower rates. Through collaboration and the public process we identified a solution that balanced development of renewable resources with reliable delivery of electricity, without shifting costs to Northwest customers who do not purchase wind through BPA's transmission system. The continuing expansion of wind power in the Northwest means we'll need more reserves to balance wind variability. We're actively pursuing operational changes to stretch the limits of the federal hydro system as far as possible. Still it's likely we'll revisit this issue in BPA's next rate case. We've built a solid foundation of mutual trust and confidence that will allow this issue to be addressed in a collaborative and businesslike fashion that serves all of the public interests at stake. Steve Wright is administrator of the Bonneville Power Administration.